When Matt Kennedy and Warren Hawkins began representing Crutchfield at car shows all across the country, they kept bumping into Stan McIntire, a vendor representative for APC. Stan displays his customized 2001 PT Cruiser at just about every show he attends. Like many show car enthusiasts, Stan had totally retooled the PT's cosmetics, but had not gotten around to upgrading the stock factory audio system. "That would really finish it off," he told Matt and Warren. So when the car show season was over, our two crack installers agreed to see what they could do for him. Stan had established sponsorship deals with Kenwood and MTX, and both companies had provided him with some high-end gear for the installation. "We had to make the product work with the car, without taking up any more of the cargo space in the rear of the car than we needed to," says Warren. As they would discover, this turned out to be no small task. The powerful Kenwood KDC-X959 receiver replaced the factory stereo. This versatile head unit plays MP3 and WMA files on CD-R/RWs and features an Organic EL high-resolution display with customizable graphics. The KDC-X959 also incorporates System E's+ Advanced Crossovers and an internal amp shut-off circuit, so audio signals sent to the component amps are strong and free of distortion. Matt then ran speaker wires, RCA patch cables, remote turn-ons for the amps, satellite tuner cable, and wiring for neon and strobe lighting effects from the dash to the rear cargo area. Meanwhile, Warren mounted the main fuse under the hood and routed the power cable from the car battery, through the firewall, and into the back of the dash. A switch for the neon and strobe lights, as well as a cigarette lighter power point, was installed in the panel just below the receiver. To support the MTX T6.6 PEM (poly-emide foam) dome tweeters in the factory tweeter openings on the top of the dash, Warren fashioned special mounting plates from ABS plastic. Likewise, Matt had to make spacer brackets from MDF (medium density fiberboard) in order to get the 6-3/4" woofers in the factory locations on the front doors. "There was quite a size difference between the original speaker and the MTX," he said. "It's safe to say that the MTX speaker we put in is the biggest speaker that could go in that location without modifying either the door or the door panel." 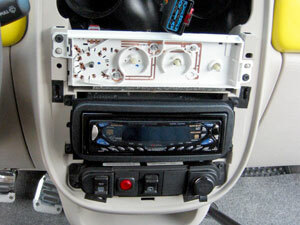 The outboard crossovers for the front components were then mounted under each side of the dash. 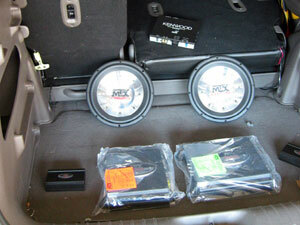 Fortunately, the MTX 5732 5"x7" speakers fit perfectly into the rear pillar openings without requiring any modifications. With the head unit, speakers, and general wiring completed, the installers turned their attention to the crafting of the sub box and amp rack that would fit in the rear cargo area. This was by far the most labor intensive part of the installation. In order to retain as much of the cargo space as possible, the sub box was designed to be low profile. Birch wood was chosen for its light weight. A yellow-tinted piece of mirrored plexiglass was used to accent the MTX Thunder6000 10" subs, and to create a continuity of color with the Cruiser's exterior paint scheme. "One thing that I absolutely knew I wanted to do in the back was to dress it up with a Plexiglass window that had APC's logo etched into it," Warren told us. So creating an etched window was the first piece of business on the amp rack. Warren scanned an APC sticker into his computer, reversed the image, and printed it out on sticker paper. Next, he cut out the logo through layers of masking tape he'd centered on the plexiglass pane and sandblasted it. The APC logo was flipped so as to show up on the backside of the plexiglass when lit with the neon and strobe lights inside the rack. "Plexiglass can be used in the same way as a fiber optic cable to transmit light. When I etched the APC logo into the bottom of the window, it was to 'capture' this light. The APC logo appears to be lit by itself without you being able to see exactly where the light comes from," he explained. The effect is very professional and totally fly. In addition to housing the MTX Thunder4244 4-channel amp and the Thunder4250D mono sub amp, the custom rack contains the StreetWires CBR44A combo fused distribution block, the Kenwood KTC-SR901 Sirius Satellite Radio Tuner, neons, strobes, and relays. To ensure proper cooling of the equipment, a fan on one end pulls air in to the box, while a fan on the other end pushes hot air out. 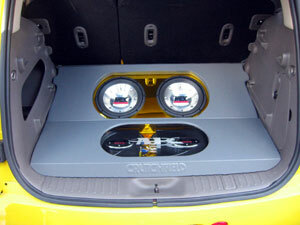 The installation process was completed with a layer of grey vinyl stretched over the sub box and amp rack. The Crutchfield logo was embossed in the front plate of the amp rack using Dynamat and a heat gun. Another subtle touch is the ability to run the entire car off an external power supply while maintaining fuse protection  perfect for displaying the car at shows. After testing the system and adjusting crossover points and levels, the team felt ready to turn the car back to Stan. "We were very pleased with not only how the system looked, but also how it sounds," said Warren. If you spot the PT Cruiser in either the APC or Crutchfield booths at upcoming car shows, be sure to stop by and check it out. Burning! 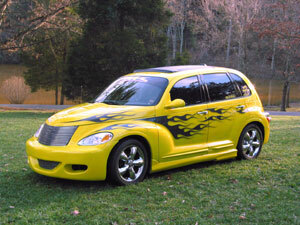 APC's 2001 PT Cruiser showcases scorching cosmetics and a first-class audio system. The Kenwood KDC-X959 MP3/WMA/CD receiver fit perfectly in the dash. A switch for the amp rack's neon and strobe lights is located below the head unit. The MTX T6.6 6-3/4" woofer (on right) dwarfs the factory speaker in both physical size and sonic output. 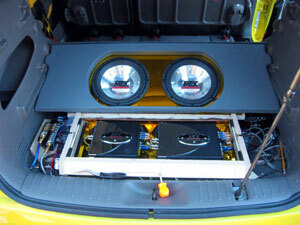 The before picture  the twin MTX Thunder6000A subs and MTX amps positioned in the rear cargo area. Half-way there  the sub box complete; the amp rack houses a combo fused distribution block, the Kenwood Sirius tuner, strobes, neon lights, and some serious MTX sonic muscle. Ready to show  the custom installation is sleek, low-profile, and definitely eye-catching.